I recently watched another movie for my Christian Perspectives class and this one rocked me more than Crash did. I watched Trade on Saturday night and about 10 min into the movie Charity got up and walked into our bedroom where she stayed the rest of the night. The point of the movie (I think) that my professor wants me to get from this movie is the injustice that happens in this world right before our eyes. I am shocked watching this at how naive I am about child trafficing and the slave trade that goes on in the world and America. "We don't see much child trafficing in America because we have chosen not to look for it". 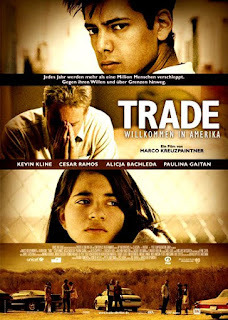 This movie made me appreciate the ministry of International Justice Mission and what they are doing so much more! Last night I watched Crash for one of my seminary classes this semester. I have to say that I am not really writing this post for anyone but myself: I want to remember this movie. Also, I feel it necessary to say, that I normally do not watch "R" rated movies. They are rated "R" for a reason and I am not watching them for that reason. If you get a chance to watch this movie (and you can handle the language and racism) it is a good movie. I hope that it will help you understand the way you view the world and how that worldview impacts those around you. This movie really opened my eyes to the type of racism that we face on a daily basis. The racism that we see now does not involve physical slavery, but emotional and verbal slavery. The impact that racism has on our society, and the fact that it is unaddressed on many levels, hurts my heart. About two years, maybe three now, we did a night on racism in our High School Ministry; I am starting to think that would not be a bad idea to talk about again. This movie has confronted my worldview and the way I live out my faith in Christ. I hope the impact this video has had on me (I cannot completely explain it yet) will not pass soon. So last year I posted something about fantasy football and how I wasn't planning on playing. Last season I won our fantasy football league (and it felt good) but there was something about playing again. I have a very competitive personality and its hard for me to do something without putting my everything in it. This year I made a decision that I would not play fantasy football and not becasue of anyone in my league, honestly I really love those guys. But this year I realized that I have more important things to do than think all week how I will win and then take the day on Sunday to make sure that I win. In short; fantasy football consumed me last year. My marriage is going super good right now! Charity and I were talking about marriage the other day and the need to invest into it. I realized that if I said "yes" to fantasy football that meant I would be saying "no" to other things in life. Charity and I are getting ready to hit five years of marriage (by the way we are planning an Elvis re-wedding for Jan!) and that is more important to me than winning fantasy football again. Sophie is at the best age right now! Yesterday I was laying on the ground playing with her and she climbed on my chest and just started cuddling with me; I loved it! I want to invest in her and if I said "yes" to fantasy football that would mean I would have had to say "no" to some of these great moments with her; I'm not willing to miss out on her growing up. Right now I am on track (taking two courses a semester and one course in the spring; when BB2 is due) to graduate Seminary in Summer 2011. I need to make that happen and I think that fantasy football would take away from that. I want to get school done before Sophie is too old; I want to have it done so that I can spend more time with my family and less time at the kitchen table (we don't have a home office) doing homework. So that is why I'm not playing fantasy football this year; I just don't have time for it. So I hope the title confuses you some, or just catches your attention, because this is reality for me! I once heard Doug Fields mention this topic and it has always stuck with me. The premise is that my truck can be, and for me mostly is, a direct representation of my Spiritual life. Let me elaberate on that a bit more. When my life gets crazy; my truck starts to get messy. I dont wash it, I leave the gas tank empty (the picture should speak for that), I have trash all over the floor and currently there are graham crackers crumbled on the backseat from my daughter. When my truck looks like that I know that I need to clean up my life; its like a warning light for me. I know that I need some extended time with Jesus to get refreshed. I can often look at my calender and see how busy I have allowed myself to become without leaving margin in my life to get refueled by Jesus. 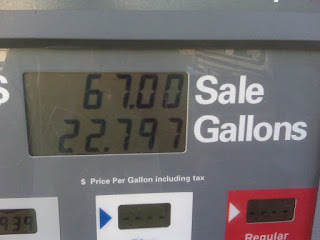 When I filled up my truck on Tuesday morning I did it right after I had filled up my spirit. The Bible talks about our spirit longing for Jesus and that is where I was Tuesday morning. I am thankful that I obeyed the logic in my life and looked at my truck. It may seem like a silly, and somewhat childish, analogy but its very true for me. "A sense of sin is almost totally lacking. Our situation is thus very different from that of the Apostles. The Pagans to whom they preached were haunted by a sense of guilt and to them the Gospel was, therefore, ‘good news’. We address people who have been trained to believe that whatever goes wrong in the world is someone else’s fault—the Capitalists’, the Government’s, the Nazis’, the Generals’ etc. They approach God Himself as His judges. They want to know, not whether they can be acquitted for sin, but whether He can be acquitted for creating such a world." Sounds like something I struggle with. I often want to blame others for my faults. I need to look in the mirror and handle the growth that needs to occur in my life. I feel like people, in general, are very good at consoling their friends. It is easy to empathize with your friend who is in need or feels they have been slighted. But the Bible tells us there is a time to console and a time to counsel. I find that I am getting better at counseling but by no means will I be the best counseling in the world. I'm sure that in five years this list will change and my method will change but wanted to share this so that it may help someone. Finally I have to add that you need to be prayed up, connected with God and Spiritually ready for these situations. When you are all three I believe that God will use you to do amazing things in peoples lives. So this week the family took a trip to Santa Maria to see Charity's parents. We flew in on Thursday on Allegiant Air for a great deal! Thursday was Charity's dad's birthday so we just hung out with the family, ate some steak and then watched football. Friday morning we just hung out as a family. In the morning we ate some food and then went to the park to feed the ducks. Then at night we went up to Pismo Beach to walk on the beach and just have some family fun! We ate dinner at Splash Cafe (and had the best Clam Chowder!). Sophie hated the sand, but loved chasing the birds. Finally when we were shopping I saw this sign and it made me laugh so hard!!! There is song out right now by Addison Road. I have to be honest that I am not the most knowledgeable music type person. But there is one thing that I know right now: "This song is rocking me". There is something about the lyrics that I cant get over. It makes me feel very insignificant and I probably need that.